Everyone will have their own presuppositions about this film as they come to watch it. We know its subject matter - a biopic of Astrophysicist Stephen Hawking (Eddie Redmayne). Diagnosed with Motor Neurone Disease at 21 and given only two years to live, Hawking has defied every expectation placed on him - and continues to do so at the age of 73! This film could have been a gush of slushy sentimentality. It could have blinded us with numbers when the theories of general relativity and quantum mechanics collide. It could have painted a simple victory for Hawking and triggered the generation of feelings of sympathy for him as a victim. Instead, it is none of these things. What we get is a gritty love story - or three love stories. 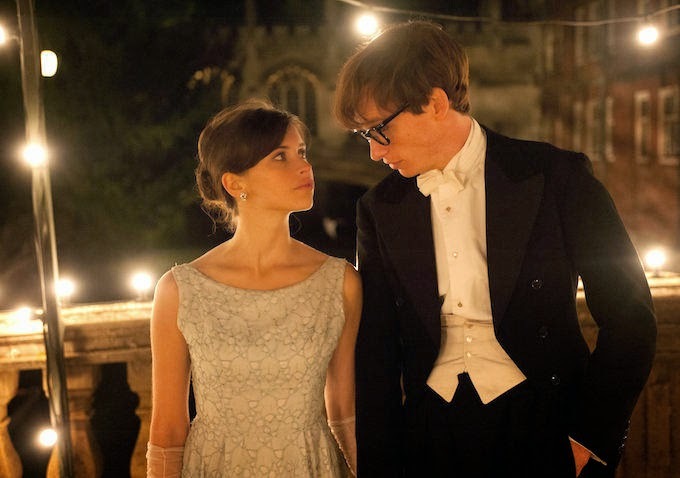 Firstly, Hawking's love of the pursuit of developing a single beautiful equation to explain everything, secondly the love shared between Stephen and Jane (Felicity Jones), and thirdly Hawking's love of life - however tenuous clinging on to it may be! From the outset, the film very effectively captures the feel of Cambridge and life in the Academy in the swinging sixties when propriety and good manners existed alongside experimentation and pushing the boundaries. The courtship of the young couple is enchanting but as their love for one another grows so does Hawking's clumsiness and lack of coordination. As was recognised by yesterday's award of a Golden Globe, Redmayne's portrayal of Hawking in masterful. The physicality with which he embodies the degenerating frame of the Professor is incredible. Equal to this is Jones' portrayal of his first wife Jane (on whose book the film is based.). Felicity Jones allows the purity and beauty of her character to shine through in a way that is thoroughly engaging. The integrity and devotion with which she looks after her ailing husband whilst raising three children and harbouring her own academic career is above and beyond the call of any duty. Don't get me wrong. The film doesn't present the main two main characters as whiter-than-white goody goodies. It presents them as complex, able and needy people who evidence inter-dependence through relationship in a compelling way. Even when temptation comes knocking through the allure of sexual seduction or popular acclaim, integrity and good old-fashioned honour prevail - at least in this account of the story. An interesting point for me was the role of Jane's faith in God and how that influenced the thought and evolution of Hawking's theories. Initially she declines an invitation to play croquet with Stephen on a Sunday morning as she attends Church and has an active faith. Stephen claims physics leaves no room for God and so they gently agree to disagree. By the end of the film, whilst not a signed up church goer, Hawking does significantly modify his position. A great example of slow burn missional activity on the part of his wife! Long-term relationships do have the potential for change. As you may gather, I rather liked this film.Both leads are utterly compelling and through their acting make a national treasure and global phenomenon more accessible in a heart-warming way. A couple of tissues are advised for the odd teary moment - but on the whole this film is thorough inspiring and uplifting. I'll give it 8/10.